A self-directed IRA is an Individual Retirement Account (IRA) that allows alternative investments for retirement savings. You can choose from many types of retirement plans for your self-directed IRA investments. Advanta IRA offers all of the available plan types, which include the traditional IRA, Roth IRA, SEP and SIMPLE IRAs, individual or Solo 401(k), education savings accounts, and health savings plans (HSA). These plans can certainly hold the traditional stocks, bonds, and mutual funds, but the unlimited options of alternative investments are what attract owners of these accounts. Self-directed IRA alternative investment options include real estate, mortgages and notes, private placements (such as LLCs and trusts), precious metals, foreign currency and futures trading, and other investment options. We understand that you might be new to self-directed investing even if you’re an experienced investor. If you have questions about the types of retirement plans or anything about self-directed IRA investing, our team of Certified IRA Services Professionals (CISP) is ready to help you along your journey. There are several ways to connect with us. Choose the way that is most convenient for you. Complete this online form and one of our self-directed IRA professionals will get back to you quickly. Schedule a free consultation with us to ask questions about getting started with your investment idea. Call us toll-free at 800-425-0653. If you’re all set and you just want to get started. Take advantage of our online option to open an account. 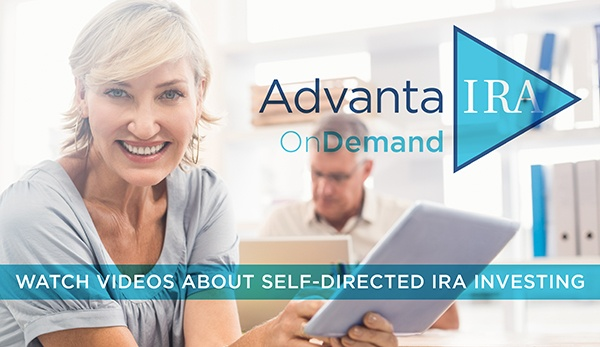 Advanta IRA is a national self-directed IRA administrator that provides superior one-on-one concierge-level customer service and educational tools to assist you in realizing the maximum benefits possible within your IRA. We offer ongoing free educational events, such as seminars and webinars, as well as other innovative educational tools created to help you learn and navigate the freedom of self-direction. Advanta IRA makes getting started with a self-directed IRA simple for you. Download our Open Account forms and start taking advantage of tax-deferred or tax-free investment opportunities today!